If you received a paycheck during your work and travel program in the U.S. during 2014, taxes were likely withheld from your pay. It's important that you file a tax return with the Internal Revenue Service (IRS) by April 15, 2014 in order to receive any refund that you may be due. 1. U.S. law requires that J-1 Work & Travel participants pay federal, state and local taxes on earned income while in the United States. This includes income from salaries, wages and tips. 2. You should receive a W-2 Form from your employer before you file your taxes. This is a document issued by your employer that shows your total earnings in 2014, as well as the amount of tax you already paid. If you did not receive a W-2 Form from your employer, please contact them immediately. 3. Work & Travel participants on a J-1 Visa are required to file Form 1040NR-EZ with the IRS for their federal U.S. individual income tax returns. 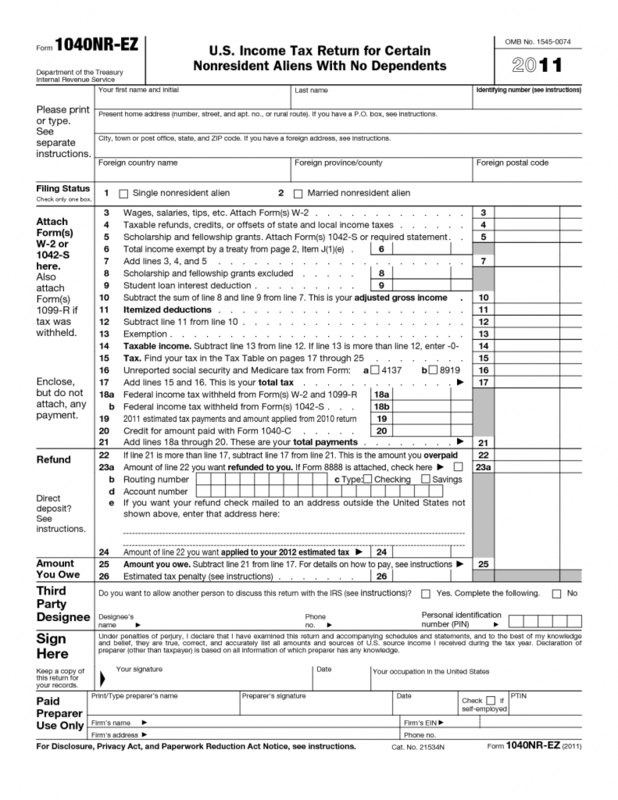 Download Form 1040NR-EZ and filing instructions from the IRS website. 4. State and local taxes may have also been withheld from your paycheck. This depends greatly on the state you were working in. Some states do not have a personal income tax; others may tax income as much as 8%. Similarly, local taxes will vary but will be lower than state taxes. Please ask your employer if you are required to file a state and/or local tax return. 5. As non-resident J-1 Visa holders, employees are generally not required to pay social security and Medicare taxes. For more information on tax regulations for exchange visitors to the U.S., please visit the IRS webpage on Taxation of Non-Resident Aliens. You may be eligible to file your taxes directly with the IRS for free. Visit the IRS website to find out more. The IRS also offers a complete list of companies who can help you file your federal taxes. Be cautious, as many websites offer free federal tax filing; however, they may charge a separate fee to help you file your state tax forms. InterExchange Work & Travel USA is not a licensed tax advisor, and we cannot provide official tax advice. Please contact a professional tax advisor or the IRS to determine your individual tax situation.